Saying you are a Tech geek and own a Tech site/blog, you will need a logo that stands for Tech Tutorial. For webmasters who have massive design experience, designing such a logo in Photoshop isn’t tricky. On the contrary, quite a few webmasters are no fan of Photoshop, for them, working on such a logo is time-consuming, and there is no guarantee of the logo quality. Having a designer to make the logo costs a big fortune, so it’s not workable for the majority. Even for those webmasters rich in designing experience, they can lack time to do it when having other important errands to run. Today, we are about to give you a quick logo design app to assist us to design a Tech tutorial in limited steps easily. The cheerful logo design tool is DesignEvo. How to Design A Logo for Tech Tutorial Fast with DesignEvo? What Do We Need for A Logo? Have A Few Ideas for Logo? Find Logo Inspirations Soon. Why Do We Select DesignEvo as The Logo Design Tool? DesignEvo, the online logo-designing tool that we’ve selected out from uncountable tries, carries an intuitive interface with easily-found accesses to all the features. Follow us and navigate DesignEvo to work out a logo on your own. It’s recommended to utilize DesignEvo inbuilt logo templates. Note that starting with a logo template doesn’t mean that you will get a similar logo result. With a few steps, you are totally possible to revamp and reinvent a brand-new logo. Doubt about this? Let’s check it out together! 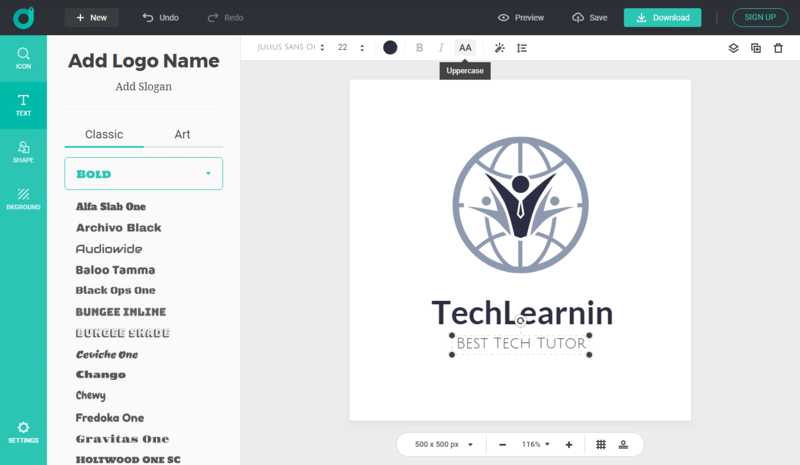 Step 1, go to DesignEvo.com, mouse-click [Make a Free Logo] and search for a template to get started. Activate DesignEvo search with keywords like tech, technology, tutorial, Internet, etc. Browse them all and pick one to go ahead. Step 2, enter [COMPANY NAME] and [SLOGAN HERE] respectively. For example, TechLearnin as the branding word and Best Tech Tutor as the slogan. Step 3, make some customization for your logo and make it unique. In this step, you can choose to add shape or background color or enlarge the logo design (mouse-select all elements and enlarge by drag-and-drop). DesignEvo has the merit to support grid-position and assist graphics center. Step 4, preview and download your logo design for use. In Download, DesignEvo offers a Free plan, a higher-resolution plan, and SVG/PDF vector plan. 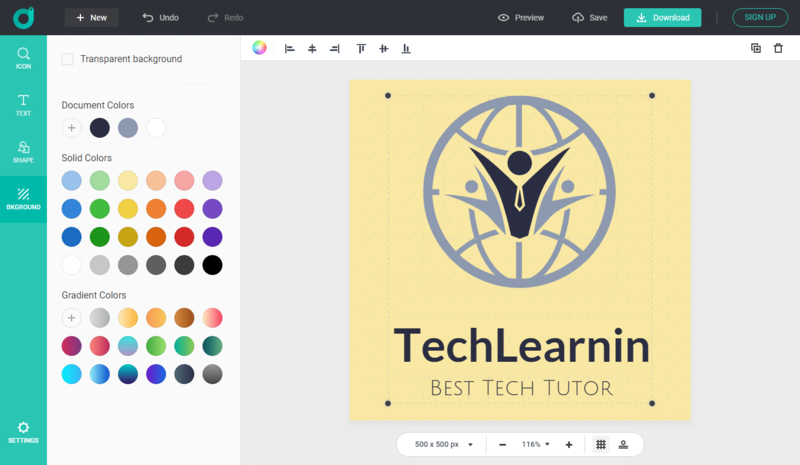 Another way to utilize DesignEvo to design a Tech tutorial logo is to create it from scratch without the help of a logo template. We won’t tell you how to make a logo in this way since this involves too much personal work and you may not create it in our exampled way. What we recommend here is to make an Abstract logo and you can find tons of options by icon searching and shape adding. Add a few elements as possible and organize them nicely. DesignEvo is among the few top online logo makers and supports designing or making a logo comfortably and fast. The fastest speed to work out a unique logo is 30 secs and anyone is possible to achieve it with the help of the easily customizable logo templates. Take a look at the overview of DesignEvo, if interested. Inside DesignEvo, you will be able to find and start with more than 5000 pre-designed templates as choices and work on your logo project. The inbuilt templates are all made by groups of designer-major undergraduates, the color, the ingredient, the style, and how to assemble them in logo template are carefully “brewing”. These logo templates are organized and classified into related keywords. So once inputting a keyword into template search box and give it a run, you will immediately see the logo inspirations for such a theme. DesignEvo covers a wide range of requirements and occasions. Any business group is entirely possible to create a proper logo on their own. The search function will retrieve you with dozens of suggested logo designs. And it’s also perfect to utilize to find some inspirations for your brand. You will find two categories as your logo font choice: Classic and Art. Pick a Classic font and you will get a black font instance on your canvas but there are more options to customize it, such as changing the color, outline effect, outline color, and many more. Art fonts are more like example logo texts or font templates. From our testing experiences, Art fonts give fewer options to customization. DesignEvo lists its icon feature at the very first top place (top-left position). There might be a reason here: It lets users customize and change logo graphics on the designing canvas. Another highlight is DesignEvo stores millions of logo icons in this feature and these icons are all easy to search through. If you are making a certain logo related to technology, or under other keyword categories, you will be fully entitled to search keyword-related icons at your fingertip and make your logo-design-decision. 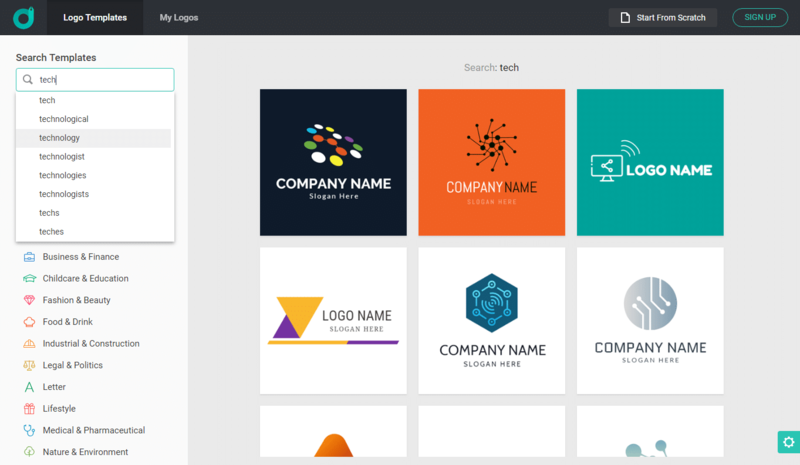 DesignEvo has a section to pick the logo shape. Once entering this section, you will see several classifications, something similar to “the tree construction” in Computer Science. Click a shape to validate it on your canvas. Likewise, you have enough options to color it and add effects. Anyway, it’s very comfortable to navigate DesignEvo shapes. To make sure your design is workable in real life, DesignEvo offer practical previews, e.g. logo printed on a white T-shirt, showing as a website logo, printed on a book cover, or demonstrated on a business wall, etc. The purpose of the preview feature is to let you know how your logo design goes, uses on different occasions, preventing you from multiple redesigning works. DesignEvo, like many other online logo generators, provides FREE service and PAID service to download your logo design for real use. The FREE plan includes a JPG image file and a regular PNG image file, all files are in a dimension of 500 px * 500 px if you haven’t changed your canvas size. While for a canvas larger than 500 px * 500 px, when choosing the FREE plan for download, you will get a shrunk-down version of the logo image at a size of 500 px * 500 px. If you want to download a logo design larger than 500 px * 500 px or a png logo with transparent background in DesignEvo, we suggest you consider its BASIC plan (high-resolution plan) at $19.99 or PLUS plan at $39.99. The difference between DesignEvo BASIC plan and DesignEvo PLUS plan is that PLUS have extra free royalty and SVG and PDF vector image. Though we haven’t shown how to design a Tech tutorial logo with other tools, it doesn’t mean there aren’t other workarounds to deal with logo design. Expert tools include renowned Photoshop and open-source GIMP. The navigation of Photoshop and GIMP are complex for many of us, but they offer the most resourceful features for photo processing. So as long as you can work with them and have enough time, Photoshop and GIMP will be the incomparable choice. Besides that, there are other logo makers, for example, Windows-based LaughingBird, browser-based Logaster, browser-based COOLTEXT, browser-based flamingtext and many more. Technically speaking, they all have their merits but may fail to compact all necessary features for logo design. And that’s the reason we introduce you with DesignEvo instead of others. Using DesignEvo to design a logo for Tech tutorial is very comfortable and time-saving, you can always find a preferable logo model to begin with and navigate it easily. 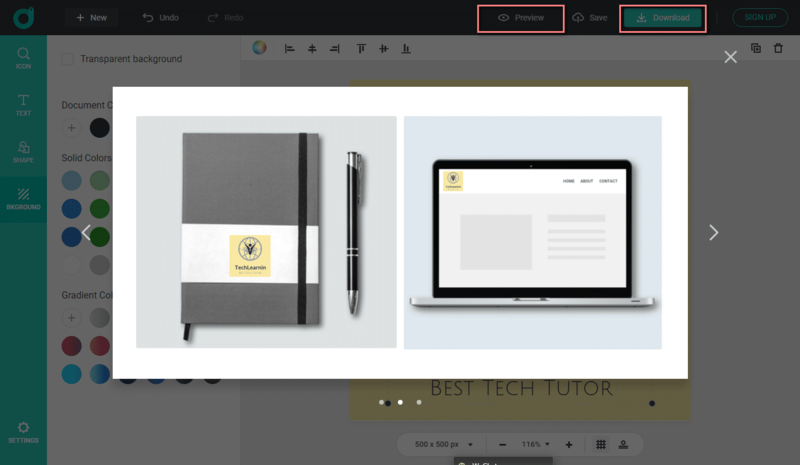 Because its templates are all designer-made, it saves you substantial time to browse bad logo ideas, which is an inevitable step when you work with an AI-powered logo maker.